It was 7 February 2009. After a decade of drought, Victoria’s flora had turned into flammable material. The Bureo of Meteorology had predicted a temperature of 44 degrees and the authorities were warning about the high risk of fires. Which came – more than 100 of them, trapping Victoria into a belt of flames, towering like furious monsters turning everything into ashes. Devouring life with unprecedented furore. More than 173 lives were lost on that day. Ten years later, some remember this tragedy as a moment in history, others, too young to have lived it, learn about it through books and narrations. But there are also those who suffered on that day and can’t forget about it; people who saw death with their own eyes and managed to escape, but also people related to those who didn’t get to escape the flames. Martha Milioni is one of those people whose life will be forever marked by the events of Black Saturday. “I lost my boy and my daughter in law. How can anyone forget this? My children were the only joy in my life. Sorrow has been my companion ever since. Instead of going to Kinglake to visit my son, I pay a visit to his grave in Lilydale,” she says. 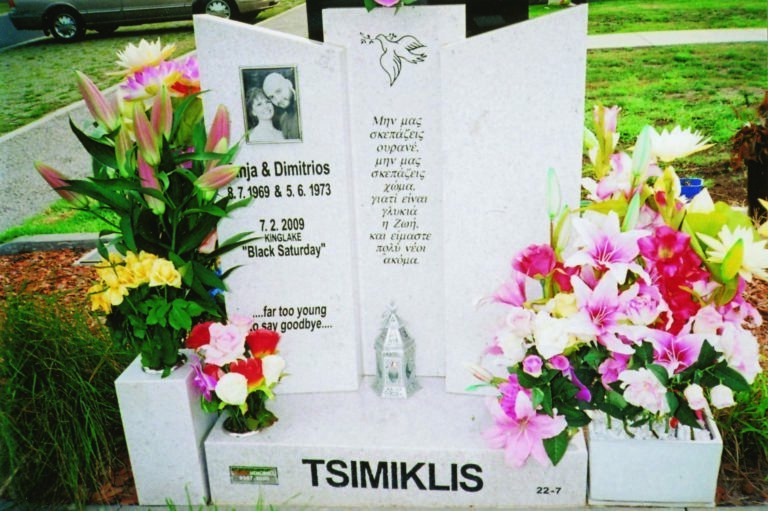 Dimitris Tsimiklis, her son lived in Kinglake, with his wife Tanja. They had been married since they were 18. 2009 was supposed to be their year – they had decided to have a child. They never got to do this. The flames surrounded their home, which ended up being their grave. What was left from Dimitris’ home, after the devastating fire. “He collected old cars, he loved them,” his mother says. Ten years later, Martha’s grief is as intense as ever, ripping her apart. You can see it in her eyes, forever sad and teary since that day. 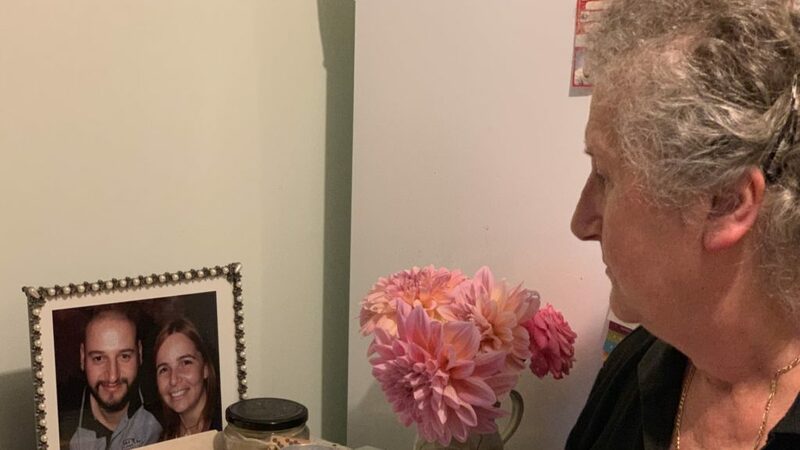 Her home is filled with photos of her Dimitris and Tanja, their smiling faces lightened up by countless candles, as if to exorcise the darkness of the horror that took their lives. When she speaks, her sorrow is masked behind bursts of blind wrath – all her emotions are expressed to the maximum, defining her life. The only thing that softens her heart is the thought and presence of her daughter and her granddaughter. She still smiles, when possible, but she remains a woman punished by fate. 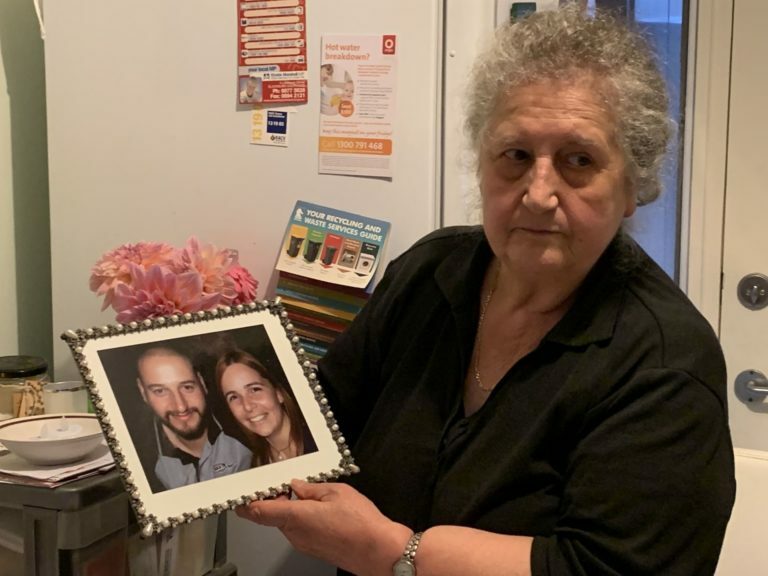 Martha Milioni holding the photo of Dimitris and Tanja. It’s been ten years and yet it seems as if it was a little while ago. Ten whole years of pain and tears, pain that has nested in our soul and that I cannot describe. There are no words. Do you know what it means to find out that the spare parts for the utility poles, where the fire started cost $10? Yes, dear people, $10. For ten bloody dollars, so many people lost their lives, among them my children. It makes you want to blow your top, thinking what happened and destroyed families. I don’t forgive them. I don’t forgive anyone responsible for this catastrophy, for the unfair loss of these lives. The fire started from the electric pole at Kilmore, at 11.47 am. 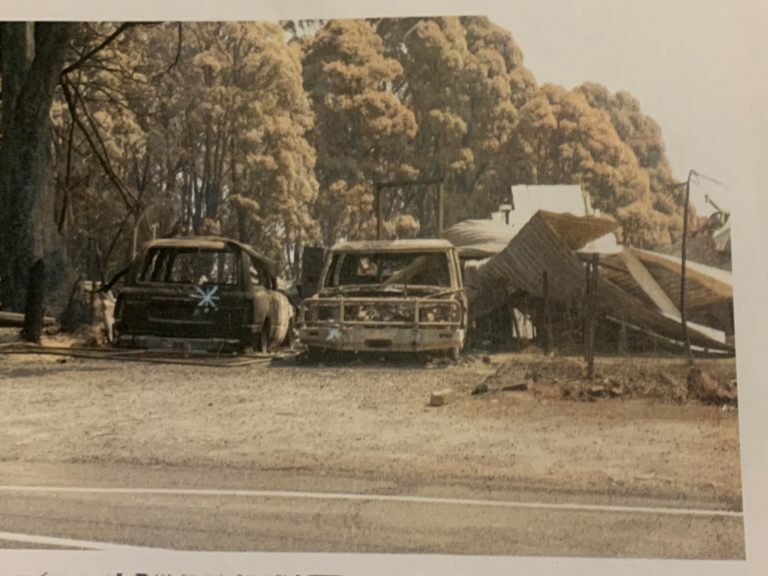 My children lived in Kinglake and they were burnt at 6pm. Look at how much time they had to warn people and prevent all this loss of life, at least at Kinglak, where most deaths happened. This is why I want to know about the CFA, where were they on that day, why didn’t they go outside my son’s house, where they always went. I want to learn, even after ten years, why the Fire Brigade was absent on that fateful day. They hid to save their lives. But why didn’t they think of the people and warn them? They had so much time to warn them and save them. It was a mockery, sending text messages to mobile phones, after the worse had happened. My dear people, the Fire Brigade was following a directive by Nixon, not to participate that day and they left people to their own dark fate. The following day, when the wind died down, the Fire Brigade made a move and found the “poor koala bears” that some lady wrote about in Neos Kosmos. [Former Victoria police chief Christine] Nixon is the first and foremost responsible. Many were at fault, but none was tried. Only we were punished, we who lost our beloved people. We lost our own. And to add insult to injury, Nixon not only disregarded everyone, she was also given the role of helping the fire victims. This is a shame. Shame on those who let it happen. My blood was boiling when I saw her. She was sending us letters, asking to meet us, who had lost our people, I couldn’t stand it. Until I discussed about it. Were was she, when people needed her? She was busy, at the hairdresser, having dinner with friends, where people out there were being roasted like lambs. I never intendend to write this, because once before, when I did the same, they didn’t print it like I wrote it, that is the truth. I hope the same does not happen this time round. What made me write, was a story on Neos Kosmos, by Ms Pavlopoulou, printed on Thursday 2 August 2018, titled ‘Respect to the dead and comparisons’. What do you mean “no”, madam! It was their mistakes that cost so many people their lives. We don’t let people die first and then show respect to the dead. Show them respect when they are alive first, think that they are at risk, find a way to save them from dying. They had the whole day ahead to do that. This is why I never forgive them, I never forgive what happened, I lost my boy, I lost my daughter in law who was also my daughter, my child. This is why pain has rooted inside me. I knew they were expecting a child too. I cannot get over this evil, it is in front of me every day and night and follows me around. In Mati, they also lived the horror of fires and the pain of devastation. The firemen did not hide, they did their best. But there were not roads there, like there are here. They built their homes without planning, they only left little laneways, like they had in their villages, they built fences and didn’t think about the future. Their children and grandchildren paid the price. What is there to say, this was a great disaster, I feel them and I understand completely. We all respect the laws here, but we can’t do otherwise. If you built something against the rules, you are made to tear it down and you pay a fine. In Greece, even those in government don’t respect the laws, what can you expect from the rest of the people? This is the result, blocked streaks, alleyways. People were lost, young, old, children, angels, there is nothing worse, I know it well, I live with it, I know what it means to have lost your beloved people, my thought is with them. I wish them strength and courage, that’s what was written. God may always be with them and damn those starting fires. With respect to all those who were lost, along with my children, with lots of love, may their souls rest in peace.